This is an idea for a feature that I never got to. Basically, someone made an awesome OSG library called EffectCompositor that allows one to write postprocessing effects in a text file. - Allow modders to use effects in specific cells, maybe by having an object use an effect file as a model. The effect will (de)activate when the model (un)loads. - Allow scripts to modify effect parameters. - Figure out how to share a render target between effects, for things like SSAO and other depth-based effects. - Add some engine hooks that will allow one to create deferred shading systems as an effect file. Last edited by scrawl on 19 Jul 2017, 23:00, edited 1 time in total. Could they be built into omwaddons and configurable in the CS? It'd be really nice to preview them there too! Ok, I just tried it out. The code seems salvagable, but it needs some more work. from most effects or else it will mess with the color of OpenMW's skybox. # Comma-separated list of full-screen effect files. Effects are applied in this order. # Files must be placed in the OpenMW resources folder and are case-sensitive. # Effect to analyze (show debug information on screen). Must be an effect from the above list. I really like their analysis (or debugging) view that shows you the different render targets and a visualization of the inputs/outputs. That should be really handy when writing new effects. The main issue I have is that there doesn't seem to be a way to chain different effects together. I tried to place another effect node as a child of the first effect node and then the scene under the second effect, but that didn't work (only the second effect showed). Also, I'm pretty sure the code that updates uniforms has a threading bug, that could cause the uniforms to run a frame ahead sometimes, but that's not really a pressing issue right now. This is kinda cool. 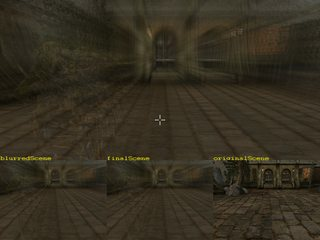 The screenshot looks like the player has taken too much skooma (in a similar idea to when you play fable, and drink too much, and the environment becomes blurry). Agreed. I can see lots of uses for this. Thanks for trying this out scrawl!